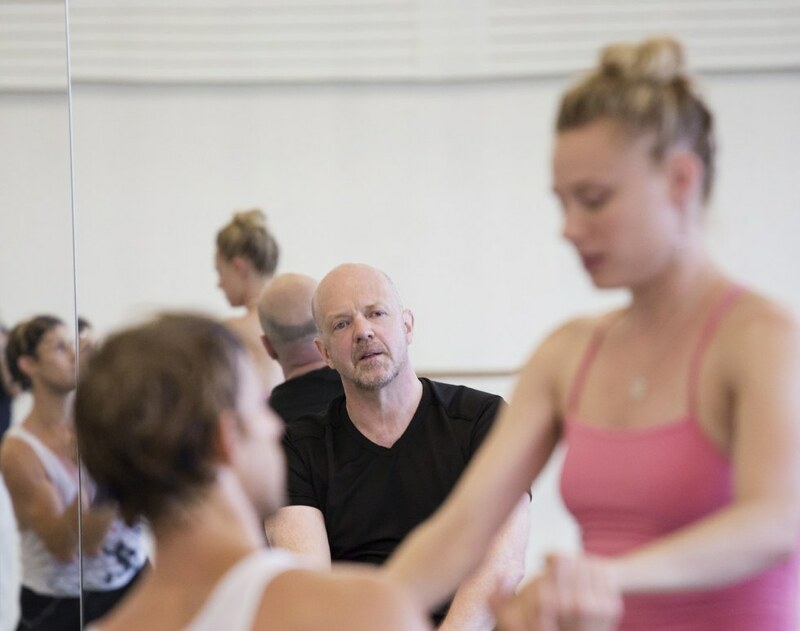 While many of today’s top choreographers are getting commissions for story ballets, their creations don’t always build a satisfying experience for the audience. As Jennifer Stahl wrote in last week’s posting, there are risks to trying to make a new story ballet. So it’s with great pleasure that I can say I discovered a dance artist I feel is a master of narrative. True, I’ve seen only one work by Danish choreographer Kim Brandstrup. But his Jeux (2015) is so intriguing that I want to see more. Happily, Jeux returns to New York City Ballet this week. NYCB's Sara Mearns and Adrian Danchig-Waring in Kim Brandstrup's Jeux, photos by Paul Kolnik. Loosely based on Nijinsky’s Jeux of 1913, it uses the same tempestuous Debussy score. More than a clear plot, Brandstrup's version portrays a woman who gets trapped in a tense mood of wariness, of paranoia within flirtation. Playing a party game where she gets blindfolded, she finds herself surrounded by people she can’t trust. As in film noir, a dark cloud of suspense hovers over the ballet. Based in London, the award-winning choreographer studied dance at the London Contemporary Dance School (The Place) and later came to New York to study at the Merce Cunningham studio. He has made ballets for The Royal Ballet, Les Grands Ballets Canadiens, the Royal Danish Ballet, Rambert Dance Company and his own group, Arc. If there is something cinematic about his ballets, it’s because he studied film at the University of Copenhagen before discovering dance. Jeux is his first commission for an American company. I chatted with Brandstrup after he rehearsed the second cast of Jeux last Thursday. Here’s an edited version of our conversation. How did your early training affect your choreography? I went to The Place in London in 1980. It was absolute hard-core Graham. In hindsight it was a fabulous gift, but at the time I thought it was terribly dated. It was Merce and Pina we wanted to study with. I was completely taken by Merce. I think it was the purity of the performing: You didn’t emote; you didn’t lay things on. That generation would say, "Do it, don't pretend." Are there any narrative choreographers that you admired? Tudor’s Dark Elegies has a sort of ritual nature—this mourning over the dead children. It has a kind of formality to it and that I loved. Later on, Bournonville. So you really got into ballet. Slowly slowly slowly. I resisted it. I felt, It’s not me. I had some very good teachers at The Place. One fabulous teacher, Nina Fonaroff, was a great believer in ballet. She said, "You’ve got to study it," and I did. What I found is that ballet, when it’s good, it’s the science of how you move the body. And then creatively you should try to be free of those prescribed steps. If ballet is well taught it creates these fabulous creatures that can do anything—like the New York City Ballet dancers. You do so much great off-balance partnering. Does that mean something to you narratively? Ballet is about balance, and the drama happens as soon as you start going off. The more precarious, the more exciting it is. When I work with dancers, I ask, "How far can you go this way and how far can you go that way? Is there any way you can push this?" And out of that falls the next thing. In Jeux there’s such a strong sense of mood that it’s almost cinematic. How are you influenced by film? Since I started choreographing 30 years ago, I’ve always storyboarded like you do for film—making little pictures. Of course now I film the rehearsals on my phone. It’s about creating a scene. And then, sometime, letting that scene go. Maybe I took that with me from Merce: You can make these very bold, quite radical shifts. Like in Jeux when the guy with the basketball comes out and the whole scene changes! When you jolt somebody somewhere else, that’s where you start making up a story. Is the story based on Nijinsky’s Jeux? In a loose way. There were two kinds of games. There was the playful ball game and then there’s the sexual manipulation. Nijinsky’s Jeux was a ménage à trois with a tennis match. For me the narrative has to be found inside the music. Half way thru Jeux there was this extraordinary moment: Something has changed radically, so that becomes the beginning of a story. It very much depends on who the dancers are. I built the ballet around Sara [Mearns], Adrian [Danchig-Waring], Amar [Ramasar] and Sterling [Hyltin]. Kim Brandstrup rehearsing Sara Mearns and Adrian Danchig-Waring. I hope NYCB has you back. I had the best time. I didn’t know whether the dancers would respond, but they did. They just move and I say, "Is this possible?" Because they’re so good the rehearsals can be playful. How do you go about creating a mood? It’s about setting a scene. In Robbins’ Afternoon of a Faun, it’s just two people in a room and suddenly something happens between them and it’s intriguing. It reveals itself in this mysterious way. If the scene is clear you don’t ask any questions; you just sit and let it happen. That’s the magic of it.